During drug development the cost of clinical trials can rise significantly for studies that require several monitoring visits across multiple sites. Traditional monitoring techniques account for a large portion of these costs. Pharmaceutical companies absorb the costs of travel when their own Clinical Research Associates (CRAs) visit sites, while Full Service CROs normally charge clients these travel costs as pass through charges. It is estimated that remote monitoring in clinical trials could reduce travel costs (including unproductive time spent travelling) by up to 30%, and in theory the practice should be scalable across small to large clinical studies over several clinical trial phases. The unproductive travel time saved also means CRAs have more time available for monitoring activities, aiding with the current CRA shortages. Not only are there issues with the traditional onsite monitoring of clinical trials and the costs associated with CRA travel, but also the frequency of visits to site causes the costs to increase. The FDA released guidance on Risk Based Monitoring (RBM) acknowledging that traditional monitoring practices can be costly and understands that pharma are looking to reduce R&D costs via improving technology. The FDA accepts that there is an industry consensus to use RBM, based on assigning a risk score using TransCelerate Biopharma’s predefined and industry accepted categories. Therefore marking a departure from 100% source data verification (SDV) at all trial sites to ensure subject protection and overall quality of trial data. This has prompted an increase in risk based monitoring approaches to clinical trials as sponsors and vendors alike can implement these tactics to potentially reduce total trial costs by 15-20%. This reduction in cost arises from increasing remote monitoring, centralized monitoring and targeted monitoring and reducing on site monitoring and the associated travel costs. This influences the monitoring plan of the clinical trial and brings together reduced costs as less monitoring can occur, for example with reduced monitoring you may be able to go to 65% SDV from 100% if you are able to accurately evaluate risks per site and allocate monitor visits to more risk adverse sites. This also includes the targeted approach to ensure a monitor visit occurs under circumstances detailed in the monitoring plan, such as unusual numbers (low/high) of adverse or serious adverse events, or other key metrics differing with similar sites. (Even with a RBM approach, all of these remain considered up-front, with triggers and actions defined within the monitoring plan). 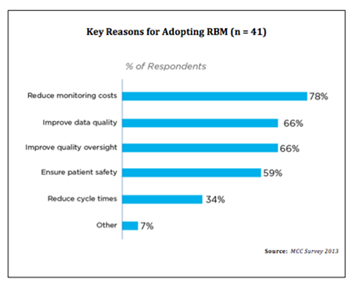 Reducing the cost of clinical trials is not the only reason for the rise of RBM. Using a risk based approach to monitoring can result in improved data integrity. This is because RBM methods use Centralized Statistical Monitoring (CSM), which is the detection of data anomalies and data outliers by preforming various statistical analytical tests that TransCelerate have endorsed. To perform CSM in your RBM approach it is advised to use the latest technologies to review the subject and site data, these technology providers and CSM service providers call this process Data Quality Oversight. However, despite these positives the industry has seen a slow uptake on the use of non-traditional monitoring solutions (at the time of this writing). Literature shows that although the guidance has been released, and published articles on the theory and approach, there are actually few companies yet to embrace RBM, and they are cautious as companies still believe a 100% SDV approach is most likely to uphold the highest quality. Also a lot of marketing materials from remote monitoring and risk based monitoring vendors who reference the 20% cost savings all make reference to one published study (which we’ve also used as a reference in our own materials) on the phase 3 cardiovascular study. We have not been able to find other references to prove these metrics but we would be happy for others to quote some in the comments section of this blog. 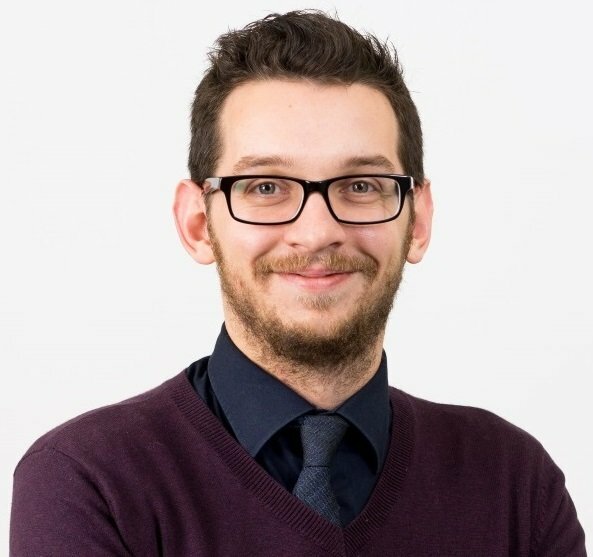 So with strong theory and marketing around RBM but companies across the industry still being cautious about implementing the approach, what has the future got in store for RBM? Recently Applied Clinical Trials published a great article based off a MMC survey that has shown the rise of RBM and its increase in popularity. We thank them for their publication of the results which we are about to present. 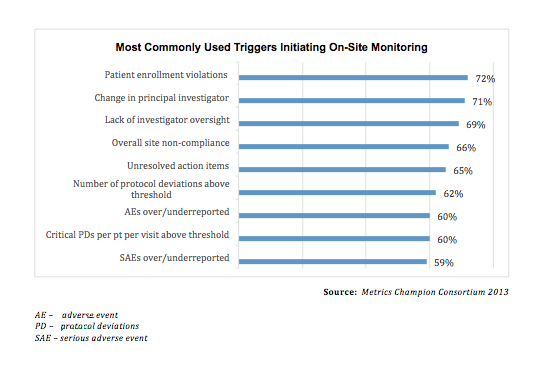 In 2009, 33% or less of 65 respondents in a Clinical Trials Transformation Initiative (CTTI) survey were using centralized data monitoring to guide, target, or replace site visits (RBM methods). The MCC survey conducted with its 45 respondents showed an increase in the acceptance of RBM. Most use of RBM happening in Phase II. 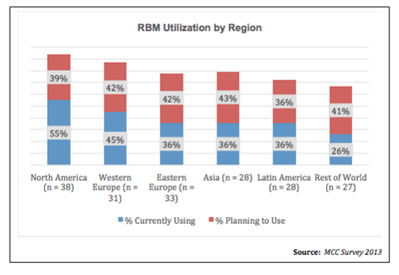 Twenty percent of respondents (n = 7) report utilization of RBM in Phase II studies, and 57% (n = 20) claim they are planning to use this methodology in Phase II. Pharmaceutical companies, improving quality oversight was the top reason (83%). Biotech firms, improving data quality was the major reason (83%). 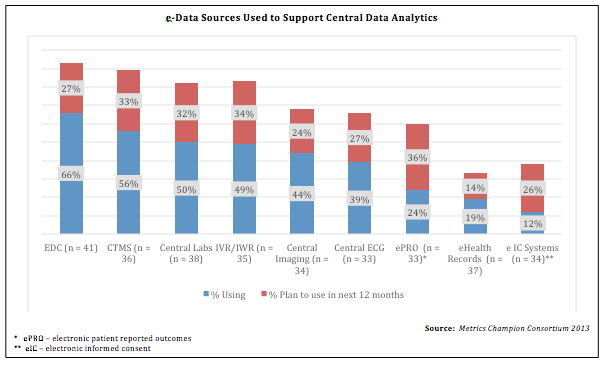 28% of the respondents indicated that they were planning to use central data analytics (CDA) to support RBM monitoring in the next 12 months compared to only 13% utilizing CDA for traditional on-site monitoring. Central data analytics with risk based monitoring: Data from electronic data sources are being analysed across all sites, from a central location, to identify trends and outliers in order to find high-risk sites. Central data analytics with traditional on site monitoring; Data from electronic data sources are being analysed across all sites, from a central location, to provide information to traditional on-site monitors. Based on these definitions at the time of the survey being conducted in 2013, it is fair to assume that CDA is the early term for CSM and Data Quality Oversight mentioned earlier in this blog. 9 sources were identified as data types for CDA. The most popular sources for CDA are not surprising with electronic data capture (EDC) at 66%, clinical trial management systems (CTMS) 56%. The other e-data sources are detailed in the chart below. The purpose of CDA is to improve the quality of clinical trials. The survey shows that 47% of respondents (n = 37) are using aggregate data analysis and 39% plan to begin its use in the next 12 months. 46% of respondents (n = 38) are using trend analysis of site characteristics and another 35% claim they plan to start using it in the next 12 months. These results show that the main triggers to cause a CRA to visit site are staffing problems, for example the change in principal investigator. This may demonstrate there is still a preference to traditional monitoring as a means of overseeing site compliance, we could assume that monitors are going to site because there may be issues at site which has resulted in a new investigator, when actually this process could still all be done remotely/by a risk based approached when using the appropriate tools. It would be interesting to see if these top reasons for on site visits change to more issues related to data, case report forms (CRFs) or failure to report serious adverse events (SAEs) once RBM has gained more popularity. The core findings from the survey have been 'improving data quality' and 'improving quality oversight' for no vendor RBM adopters. Therefore stakeholders have to work out the type of RBM they want to use. Will it be reduced SDV? CDA and on-site monitoring? Remote monitoring? Overall a variety of methods are being used for different studies, phases and adopters and they are either moving to RBM methods, or moving to RBM methods alongside traditional monitoring techniques as a safety net. One trend that is visible is that CDA is clearly important to all and improved data quality is a priority regardless of your monitoring approach or percentage of SDV. CDA is an earlier definition for Data Quality Oversight and those involved are keen to use statistical methodologies to improve data integrity which was also highlighted in the ICH E6 Addendum R2. Quanticate offers Data Quality Oversight (DQO) of site data which uses statistical analytics to generate reports to improve data integrity as outliers and data anomalies are discovered. DQO can be applied to any clinical monitoring method, submit a RFI if you would like to hear how we could improve data quality and a member of our Business Development team will be in touch with you shortly. ICHGCP E6 Addendum R2 - What do you need to know?